Working with data this semester? Want to brush up on your foundational Excel skills? 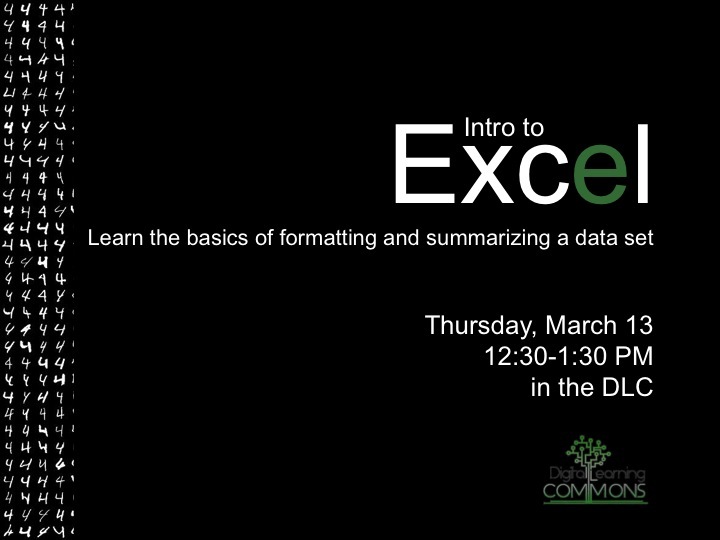 Come to the DLC Thursday, March 13 from 12:30-1:30 to go through a basic training on how to format and summarize a data set. We’ll go over how to sort your columns and rows, hide what you don’t need (and unhide it if you decide you do), freeze panes to make scrolling easier, calculate summary statistics like mean and standard deviation, and anything else you want to know. This is a beginner class and we will move as slowly as needed. In future weeks we will offer more advanced classes depending on demand. Bring your computer and any specific projects or questions you have.